Hi, I am interested in your 1981 Chevrolet Camaro (stock #4806-CHA) listed on Autotrader for $17,995. I'd like to get more information about this vehicle and confirm its availability. 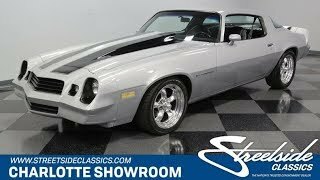 This 1981 Chevrolet Camaro nicely blends classic Z/28 upgrades with plenty of modern performance pieces to create a distinct and shining V8 coupe. The factory correct silver looks quite nice on this car. There was a full restoration in 2015, and a professional respray has created a great canvas. But its the addition of the black that finishes this aggressive showcase. The dark grille and blacked-out headlight bezels give this plenty of Z/28-style appeal. The iconic dual black stripes were painted and cleared over so you get a uniform shine across the body. Plus, they do a terrific job of highlighting everything from the full-width rear spoiler to the upgraded cowl induction hood. Youll love details like the modern Camaro script on the fenders and the large American Racing Torq Thrust alloys. Inside, the black matches the exterior accent color for a nice uniform presentation. The dark finish is well preserved on the seats, door panels, and carpeting. This is comfortable for everyone with features like nicely bolstered front bucket seats and an upgraded AM/FM/CD stereo. But the best treats are reserved just for the driver. That includes a grippy Grant sports steering wheel and a B&M ratchet shifter boldly coming out of the center console. The 305 cubic-inch V8 looks terrific under the hood. This motor was rebuilt and painted, so the bold orange block radiates from within the crisp dark engine bay. Plus, this has a full Edelbrock upgrade package that includes the ribbed valve covers, matching air topper, and four-barrel carburetor. Plus, theres an enhanced rumble from the glasspack-style dual exhaust. This is an easy drivers machine with features like power steering, front disc brakes, three-speed automatic transmission, and the grip of modern performance tires. Distinct and iconic - when you can get a classic like this for such an affordable price, you know it wont be with us long. Call now!